We get up to speed with the latest leaps in Line 6’s guitar‑modelling technology. The Line 6 Variax has evolved considerably since the first models appeared. They sported no conventional magnetic pickups at all but instead had a set of six piezo pickups set into the bridge saddles. These picked up the signals from the individual strings and the guitar then converted them to a digital signal before processing them via the onboard DSP modelling engine. The same hexaphonic pickup system is still used today, but for the past few years the modelling technology has been put to work alongside the conventional magnetic guitar pickups. This has given the user the ability to switch between the ‘normal’ and Variax modelled sounds, and also to provide a safety net should the Variax battery ever go flat during a performance. Since Line 6 were acquired by Yamaha, the Variax technology has been teamed with Yamaha‑built guitars, and this current generation uses a more detailed modelling process that has been made possible by increases in the DSP power that runs the HD v2.0 firmware. To take advantage of this power, the Line 6 engineers used the best‑sounding guitars from a very valuable collection as the benchmarks for their models. The basic formula, however, is pretty much the same as before for the majority of the guitars being modelled (see box). 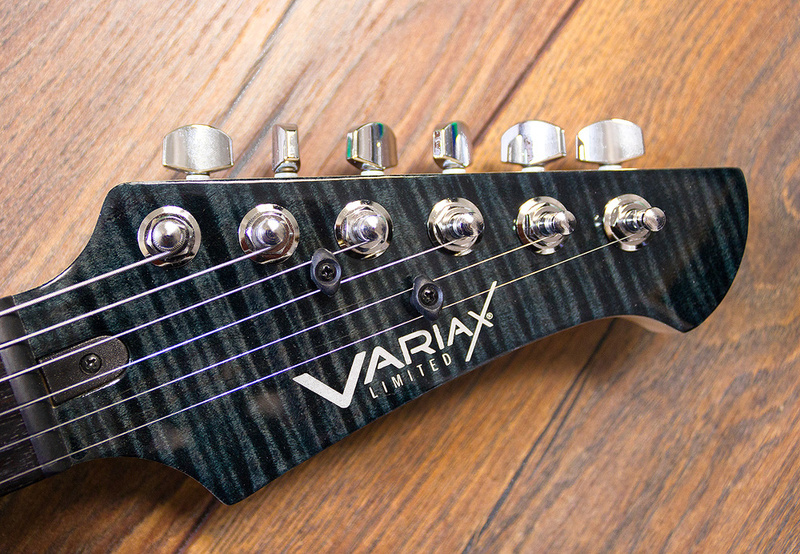 There are now several different guitar models in the current Variax range, including two Shuriken models and three James Tyler models (often referred to as ‘JTV’), one of which is a dual‑humbucker, single‑cutaway design. In this review we are looking at the least costly Variax Standard — the specific model sent for review being the Variax Standard Limited Edition Onyx, the latter parts of the name referring to the finish on the body. A push/pull dial switches between regular and modelled guitars, and accesses one of 10 preset model banks plus two further user‑definable custom model banks. The user banks can be set up using the free Workbench HD software, which connects to the guitar via a dedicated USB interface. You can also just copy your favourite factory presets into the banks for ease of access, if you wish. The 10 switch positions are called banks because the five‑way pickup selector switch on the guitar accesses five different presets within the bank, usually (but not for the Acoustic and Reso models) corresponding to different pickups and/or combinations. 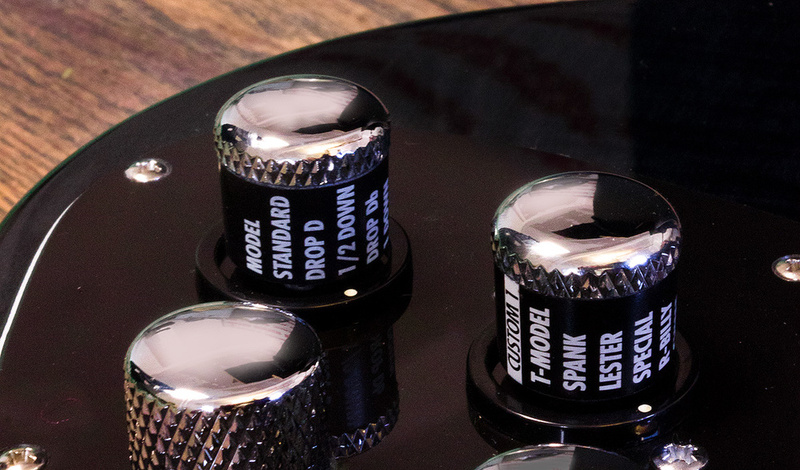 As with previous Variax models, the model selection is via conventional looking knurled knobs on the guitar — though now there are more and better models on offer.In Variax mode the Guitar Model Select knob LED illuminates to show the active guitar model. We’re told that the output levels of the modelled sounds have been matched to the original instruments, so a humbucker model may sound louder than a single‑coil model. As with earlier Variaxes, the guitar’s Tone control adjusts the virtual mic position rather than EQ for the acoustic models. Note, though, that the Workbench software allows you to mix in some of the sound of the guitar’s magnetic pickups with the modelled guitar sounds. A second knob selects from 10 pre‑loaded alternative tunings, but these can be changed using the Workbench software if you need something less common. The models and tunings can be used in any permutation. The Standard setting leaves your guitar tuning alone — in other words, it follows the way you’ve physically tuned the strings — but the pre‑loaded Alt tunings assume you’re using standard guitar tuning. The Model position uses whatever tuning is stored in the selected preset. And if you don’t use standard tuning or want something that’s not on offer, you can construct your own set of Alt tunings, again using the Workbench software. The Variax standard is a three single‑coil pickup guitar with a vibrato bridge, and it shares its DNA with Yamaha’s Pacifica— which in turn tips a wink towards Leo Fender’s finest. 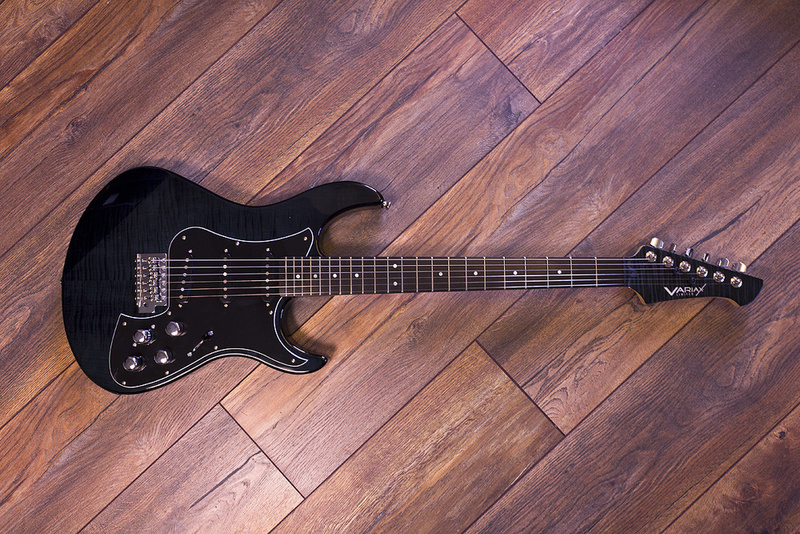 This example has a bolt‑on, 22‑fret maple neck with a dark‑wood (known as Macassar ebony) 13.78‑inch radius fingerboard. The 25.5‑inch scale neck has a palm‑friendly medium profile, though I thought perhaps the fingerboard edges could have been rounded a touch, to make the guitar feel that little bit more comfortable. There’s a forearm chamfer but no belly cut on the rear of the alder body, which makes this guitar a little heavier than a typical Strat. Our review model was set up well right out of the box and once the strings were stretched in, the tuning was pretty stable, aided perhaps by the black, self‑lubricating Tusq Graphtech nut. The three single‑coil Alnico V pickups are described as ‘vintage voiced’, and the piezo saddles are from LR Baggs. In ‘normal’ guitar mode, the pickup switch works as it would on any Strat‑type guitar, accessing individual pickups or either of the outer pickups combined with the middle pickup. Unlike a Strat, there’s just a volume control and a single tone control (in contrast with the Fender Strat’s dual tone controls), and in modelling mode the volume pot taper is arranged to behave as on the modelled instrument. If you fancy a solderless rewire, you can change the pot and capacitor values in the Workbench software, as well as wiring pickup pairs in series or parallel. Overall, the standard of finish and engineering is all that you’d expect from Yamaha, though it’s worth mentioning that the vibrato would benefit from a spring in the arm cavity, since the threaded arm feels quite loose until you reach the end of the thread. By way of connectivity, there’s a standard quarter‑inch jack to connect to your amplifier, and a second port that takes a network‑style cable that connects to the included USB interface. Power comes from a lithium camera‑style battery that fits into a compartment on the back of the guitar, and a charger is included. A fully charged battery gives around 12 hours of operation. However, you can also supply power to the Variax without a battery if it is connected to VDI Digital Input equipped hardware, such as the Pod HD500X or Helix, or a JTV Cabled Power Kit. You can’t, however, charge the battery or power the guitar via USB. We’re told that the HD Variax range can be paired with the Line 6 Helix, Pod HD and Firehawk families for the saving of combined guitar/effects presets. There’s also limited compatibility with Pod XT, Pod X3, the Vetta II amplifier and some other legacy Line 6 products. Both the body and headstock of the Onyx model usually appear almost black, but from certain angles and in the right light, the decorative pattern is revealed.In addition to the expected models inspired by Fender’s Strat and Telecaster, Gibson’s Les Paul, Special, Firebird, Super 400 and 335, there are semi‑acoustic rockabilly models based on Gretches, emulations of both six‑ and 12‑string Rickenbackers, a Danelectro and a smattering of acoustics, again with 12‑string options. There’s also a banjo, a resonator guitar and an electric sitar, where the tone control adjusts the level of the sympathetic strings. Some users have wondered why a ’Strat‑alike’ guitar needs a Strat model, and there are actually two reasons: firstly the model is hum‑free and secondly, you can use the alternate tunings with it. Without using the Workbench HD software, you can store any of your favourite sounds into the user locations along with an Alt tuning if you need one. However, the Workbench HD software is very easy to use and lets you do things like change pickup type, position and angle as well as customise tunings and component values. If you fancy hearing a Les Paul body with two Strat pickups and a Gretsch ‘toaster’, you can build your own right here, and save it as one of your custom sounds. You can also replace any of the original Alt tunings, other than Model and Standard, as well as mixing in some of the magnetic pickups — which only makes sense on patches with standard tuning of course. The factory Alt tunings include drop D, down a semitone, down a tone, open G, baritone and DADGAD. The use of piezo saddle pickups has both good and not‑so‑good aspects. The chief benefit is that they are totally immune to electromagnetic interference, which means the DSP always gets to deal with a clean signal. This is good news in the studio, where you might very well be working very close to equipment that causes conventional guitars to buzz and hum. The down‑side is that they make the bridge slightly microphonic. It’s not usually a problem in practice, though if you’re heavy‑handed on the vibrato arm you may hear some unwelcome noise. While this inevitably remains the case, this new model seems better behaved in this respect than the original Variax models. Right out of the box, while the guitar itself is decently constructed, it felt a little too ‘new’ for my taste. It would benefit from a bit of playing in, and if it were my own guitar the first thing I’d do is ‘roll’ the fingerboard edges with a scraper. The sound from the new strings was a tad on the bright side, and this also translated to the modelled guitar sounds, but that’s something that would naturally settle down after playing for a few hours. Certainly there was no lack of ringing sustain, and the action was creditably low without choking. Played with the conventional pickups, it comes as no surprise that the guitar sounds very much like a Fender Strat, though having the single overall tone control is quite useful, as it allows the sometimes brash bridge pickup to be tamed. Switching to the modelled S‑type and comparing with the real thing, the sound is close but not identical. 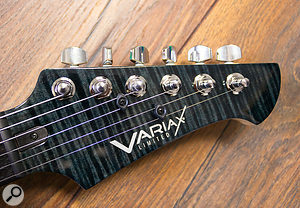 That’s no surprise, though, as the Variax version models a specific instrument that has different pickups and its own unique resonances. The modelled sounds do seem to have a slightly exaggerated attack, possibly due to the response of the piezo pickups, but various forum exchanges suggest that these take only a few hours of playing to bed in fully. The other electric guitar models fare pretty well, and though getting a full‑on Les Paul grunt is a bit of an ask, if you’re in a covers band and you need to throw in a ZZ Top number, you can get close. To my ears, the other solid‑body models sound much as they do from my original Variax (which I still have) but with perhaps more in the way of dynamic response and also a little more clarity. As with earlier models, the 12‑string emulations work really well in the context of a band but, like the acoustic emulations, they still don’t really stand up to close solo scrutiny. In fact Line 6 might have missed a trick with the acoustic emulations, by not allowing some of the piezo pickup signal to be mixed in to ‘dilute’ the very aggressive filtering necessary to transform the spectrum of an electric guitar string into that of an acoustic guitar. The semi‑acoustic electric sounds are nicely convincing, while the resonator guitar is excellent. So too is the electric sitar and, in a mix, the banjo also sounds surprisingly authentic. Given its modest asking price, the Variax Standard has the makings of a good electric guitar, even without its Variax capability — though I feel that not getting a gig bag as standard is perhaps a bit tight. Yes, the guitar would benefit from a little fettling to make it more comfortable, but at heart this is a well‑built guitar made using high‑quality materials. The Variax capability adds an immense convenience factor — very few of us can turn up at pub gigs or to a studio session with a dozen different guitars — and for the most part (I’m still not sold on the acoustic sounds, especially for recording), the sounds are reasonably convincing. There are plenty of good sounds to be had, all without the hassle of hum and buzz, and with alternate turnings available at the turn of a dial. There aren’t really any direct competitors, though the more costly Roland V Guitar — which offers fewer options and no software editability — works well and is built into a US‑made Fender Stratocaster. Regarding the question of how the original and HD modelling systems compare, Line 6 tell me that 18 of the 20 electric guitar models in Variax HD were remodelled versions of the same (or similar) physical guitars from the original Variax generation — and that the HD modelling is, from both a DSP and process perspective, more accurate this time around. There are some very distinct differences, if you’re listening out for them. For instance, the Les Paul pickups are louder, the archtops are more accurate, and the Strat is much more realistic. Line 6 have also, amongst other things, made improvements to the filtering of undesirable sonic artifacts and improvements to the response of the modelling when palm muting. Wide range of modelled sounds. Easy edibility using free Workbench HD software. Variax sounds are immune to hum pickup. Alternate tunings — without retuning. To my ears the acoustic sounds still fail to convince in isolation, though they work well enough in a band context when mixed with other instruments. Though some users may perceive little difference in sound between the HD and previous Variax models, the partnership with Yamaha has produced a cost-effective guitar that plays well in its own right as well as delivering all the Variax options.